Jazeera Airways starts new flight from Kuwait to Hyderabad daily flights from November 2017. Jazeera Airways Economy Class offers seamless and efficient services with a generous baggage allowance of 40 kg (** 30 kg for flights To/From India). Once onboard, you will be served your choice of meals and have the chance to take advantage of Kunooz Duty Free and read J9 Magazine’s latest news and features. Jazeera Airways Business Class caters to our passengers’ needs from the moment you book to the second you arrive to your destination. 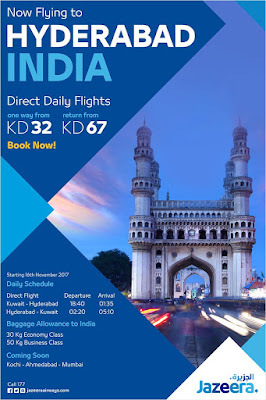 You will receive priority treatment, with your highly flexible ticket, free access to the Jazeera Lounge and 60 kg ( 50 kg for flights To/From India). .
Children above the age of two (2) and below the age of twelve (12) years are regarded as Minors. Children aged between the ages of 2 and 5 must be accompanied by a companion aged 18 years or more. IndiGo may, at its sole discretion, accept unaccompanied minors, that is, children aged above 5 and below 12 upon payment of an additional fee.A parent or guardian is required to complete a signed form (Form to be downloaded from indogo official website) at the point of check-in at each departure airport prior to travel, which must include the name and contact numbers for a parent or guardian (above the age of 18) who will meet the unaccompanied minor at the point of arrival.Valid photo-ID for both the unaccompanied minor and the parent or guardian is required at the point of check-in. During the flight our cabin crew will keep an eye on the child and will make sure that they have everything they need. Do not worry about the meal, as it is included on our Flying Solo program. To make sure that the child has a comfortable flight, the parent is requested to pack medication, warm clothing and a favorite toy or game in their hand baggage. If the stopover at transfer station is less than 6 hours and if the child is booked through out on IndiGo, we shall be able to accept the child under Flying Solo Services. If the stopover at transfer stations is more than 6 hours and/or involves night halt and/or transfer is on other airline except IndiGo, Indigo shall not be able to accept the child under Flying Solo services. In such cases child must be accompanied by someone who is above the age of 18 years in age. Under 5 years - Flying solo is unavailable, the child MUST travel with someone over the age of 18 years. 5-12 years - Book Flying Solo and can travel on all flights 13-18 years - The child can travel alone or indigo would be happy to offer Flying Solo service.